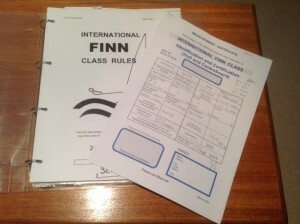 How to register your Finn with the BFA. The process of registration of Finns is easy enough if you follow a few simple rules. Unlike mass-produced classes such as the Laser there is a bit of work for the new Finn owner to do. This is clear enough from the certificate but a surprising number of people are unsure of the process. The availability of Personal Sail Numbers (PSNs) muddies the water a bit as owners may have something readily available to put on their sail, but the fact remains that if the boat is not registered the certificate is not valid and therefore you are not sailing a Finn. For a new boat, the registration will be using the latest version of the certificate and measurement form. The new owner will be given the documents by the builder, the boat will have been measured and an ISAF number, effectively the boats fingerprint, will have been issued and the ISAF sticker attached. Upon receipt of the documents the Registration Secretary can then issue the new sail number. 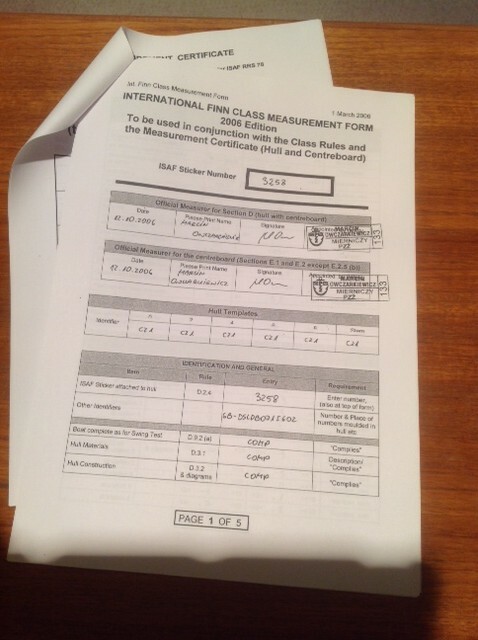 The BFA is required to stamp and date, bottom left of page 2 of the certificate. There are many boats that have been sailed under a PSN which were never originally registered when they should have been. The registration procedure is as for a new boat except they there may be different forms involved; measurement certificate Page 1 (Regatta Identification) plus page 2 Identification and Certification (Hull and Centreboard) and reweighing form if the boat has been reweighed in the past. There is no mechanism for cancelling registrations in previous countries, something that would be cumbersome and tedious. Therefore a single boat could have several Registered Sail Numbers under different Nationalities. It is very important that the BFA Registration Secretary checks the ISAF number to ensure it is not in the register already as the boat might have had a GBR sail number issued, been exported, then re-imported. The procedure for registration is the same as for a late registration. If the previous National Association signature or stamp is on the certificate new forms as per late registration can be issued. The Finn Class has reduced the total hull weight twice in the last 20 years, as building techniques improved. Most pre 2009 race boats will have had corrector weights removed and the boat reweighed and swing tested, but you may come across a Classic boat that is overweight and can now be reweighed. If you have a boat that was reweighed from the 2009 weight reduction from 120 to 116kg, it may have either a new Page 2 of the measurement certificate issued after a reweighing or a reweighing form. Both require a stamp from the National Finn Association. Either form is not a replacement for the existing certificates but is just added to it as an Addendum. The old style certificates had spaces for new owners to put in their details and sign to say they would keep the boat within the rules. There is a requirement to forward this document to the Registration Secretary to ensure that the certificate is certified by the BFA. 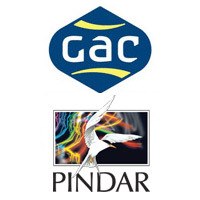 The new certificates require the new owner to download a Page 1 (Regatta Identification) and page 2 Identification and page 3 Certification (Hull and Centreboard) from the ISAF website and fill it in. The Registration Secretary can print and complete the forms to help new owners with the process once he has been advised of the change of ownership. There are a number of reasons certificates are lost. Sometimes it is older boats where the paperwork has become separated many owners ago, sometimes it is carelessness or theft, and the most dramatic reason we have had been given is someone’s house burning down! You need to take good care of your boat’s measurement certificate as without it, it is not a Finn and as such worth a lot less. If the BFA holds a copy of the certificate it can be marked up signed and stamped to show it is a copy and is verified by the BFA. The same documents issued for change of ownership are used in the case of lost certificates, once confirmed the boat has been registered before. In all cases please contact the Registration Secretary if you have any questions regarding the process.